Since we all have candy on the brain (at least at my house, we do!) I thought this Sweet Treats digi page would fit the occasion. I have to say - I am VERY PROUD of myself this year! I bought my candy, and did NOT open it (unlike other years, lol) so I *was not* forced to head back to the store for more supplies. YEAH FOR ME! lol. I have been practicing in Photoshop CS2, and have been wanting to give "selective coloring" a try forever. I was surprised at how simple this technique really is! All you need to do is duplicate your photo layer, adjust the duplicate layer to black and white, and then "erase back to color" the portion you would like to showcase - in this case, those bright lolly pops. Now, you will want to play with your hue saturation a bit, because it can be TOO bright otherwise - give it a whirl and see for yourself how easy it is! Wouldn't this be darling to do on a bath page, with a bright yellow rubber duckie? Or a beach page, with a colorful beach ball? I will for sure be looking through my snapshots looking for more opportunities to use selective coloring! Don't you just *love* Halloween? I do! I seem to gravitate towards all of the Halloween stuff. 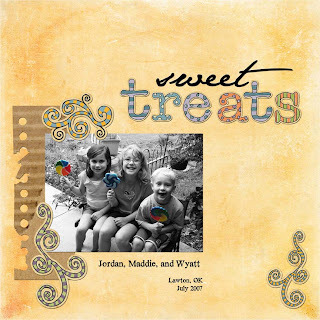 There are a TON of fun papers, stamps, embellishments, and of course DIGI KITS too! 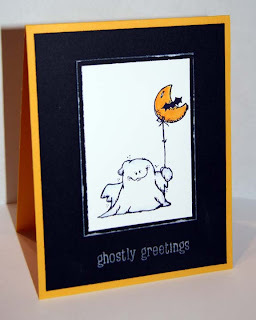 Project Credits: ghost stamp from Whipper Snapper, sentiment from Hero Arts, cardstock from Stampin' Up!, Copic Markers. Have you seen the new freebie from Shabby Princess? It's called Harvest Spice and I couldn't wait to try it out! It is PERFECT for fall/non-Halloweenie pages. Today we took our annual trip to the Punkin Patch (Nelson's Farm). Grandma Sue was able to join us, and we had a great day! 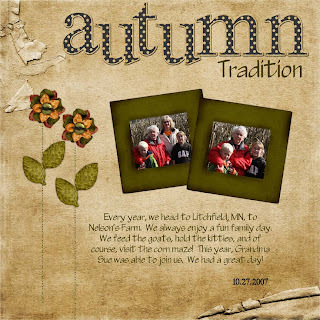 We have been going to this farm for several years because there is so much to do. They have cows, pigs, goats, sheep, ducks, chicks, and even turkeys. There is a "farm trike" racetrack, panning for marbles, wagon rides, and even an old fashioned soap box derby. Of course, the CORN MAZE is a favorite. Each year the farm celebrates a different theme, with a corn maze to match, and this year's theme was The Wizard of Oz, complete with a yellow brick road.